Are you suffering from computer eye strain and other related issues? Are you looking for an effective eyewear that can help protect your eyes? Well, I suggest that you read this article in order to learn more about the best computer glasses of 2018. Computer vision syndrome has been a widespread problem especially today in our modern world. We can’t deny the fact that almost everything that we do involves digital devices such as computer, laptop, tablet and even mobile phones. This in return gives a major problem to our eyes. These devices emit harmful radiations and blue light that disturbs the normal function of our vision. In spite of this concerns, there are already plenty of preventive measures that you can do to minimize the damages to your eyes. One of them is wearing computer glasses. Basically, this eyewear has a special tinting on the lenses that reflects the harmful blue light back to the environment. This in return increases the time that you can spend in front of digital screens without feeling any eye fatigue. So, I have listed some of the best computer glasses that you can take advantage of. This list is based on the quality, effectiveness, and affordability of the eyewear. I hope that this can help you choose the best glasses that suits your needs. The temples of this Spektrum glasses should be headgear compatible. This means that you should not face any problem when using your headphones while the glasses are still on. They use modern technologies that help them in filtering the blue spectrum from the light and enhance the image quality for the eyes. The lenses also have a special Amber tinting on them. This tinting helps the user in increasing the number of hours in front of the monitors. While wearing these lenses, you can work all day long without having any headaches and dry red eyes at the end of your day. 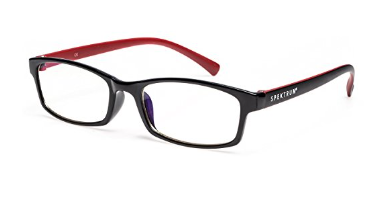 Spektrum does not offer any other special accessories with the glasses. On opening the package, you would find the glasses, wrapped in a lustrous sheet of fabric, a small cleaning cloth with a small manual and a card. J+S Vision Blue Light Shield Computer Glasses is a protective eyewear that claims to offer help in fighting the most regular present day eye issues. The lenses can block about 90% of the high-energy blue light and about 70% of the low-energy blue light. Inside your package, you will find several things. There is a protective hard J+S shell, and cleaning fabric specially designed for cleaning the lenses and the glasses themselves. Gamma Ray 003 Glasses is specifically designed to reduce the eye strain that is caused by long hours of using digital devices such as computer, laptop, cell phones and even tablet. The frame is made up of ultra light weight and flexible TR90 material (plastic like material). It is designed for long term use and increased durability. Like what the they say about the frame, it is light and it feels like nothing when you wear it. But for those who have just started using glasses, it may feel uncomfortable at first. But later on, you will just get used to it. The lenses used in Gamma Ray 003 is amber tinted. It is used to minimize the digital eye strain caused by the blue light from the digital screens you are using. Another thing that I like about this pair of glasses is it includes a frame carrying case and also a cleaning cloth. Eyekepper Vintage Computer Glasses claims to provide protection that helps in fighting the root causes of dry eyes and headaches after long working hours. The material used in this eyewear does not only provide sturdiness but also helps in maintaining the luster on the frame. You can also choose your perfect fit from a collection of fourteen sizes. The lenses use i-AMP Technology that filters the light to give a perfect and clear vision. Lenses work by filtering the incoming light beam and reflecting back all the dangerous wavelengths from the entire spectrum. By the way, the lenses also offer anti-glare coating with a light Yellow tinting that helps in protection against the dry currents near the fluorescent screens. In the package, you will find a lustrous sleeve of fabric with glasses, a cleaning cloth and a hard zipper case for protecting the glasses. Eyekeppers have also provided a manual for you so that you can get familiar with all the parts of the glasses. The small sleeve of fabric that has the glasses wrapped in it can be used as a cover for a long time. The lenses are round and nice. I must say that they look cool when you put them on. Actually, they have the ability to block about 97% of the blue spectrum and other high energy radiations that spell trouble for your eyes. One of the best features that the glasses offer is their looks. The glasses have compact and bold frame structure which provides them with an awesome look. These lenses are ideal for gaming and reading purposes, as both of these activities require a huge demand of concentration power. The lenses help the eyes in focusing and producing a better image quality which would help in avoiding eye fatigue and tiredness. What I like the most about this eyewear is that it is designed in such a way that the users can adjust it easily. You can adjust it a little to match your head size and shape. The frame wraps around your head perfectly which provides a great grip to the glasses by which they can sit in their position for long durations. The lenses also use Spectrum Control Technology to block almost all of the blue light entering our eyes. By the way, the statistical data showed that these lenses can block up to 98% of the blue light that falls on them directly. The lenses also assist in forming a much more focused and clearer image and help eye lenses relax. By the way, the Uvex do not provide any extra items or accessories with the glasses package. 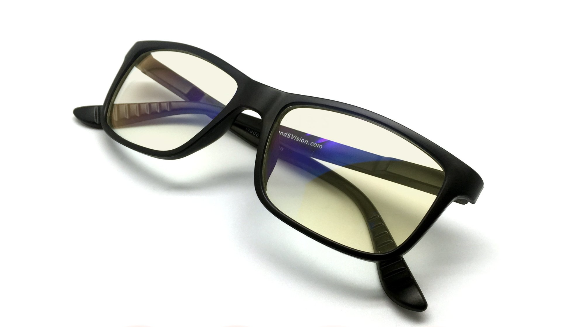 GameKing Computer Glasses is a protective eyewear that is made for those people who owns prescribed lenses but wants to have protection from digital screens. Since this is a clip-on glasses, there is no frame attached in it. It is a simple pair of lenses that come in between your eye and your prescribed lenses. By the way, the lens is designed to have amber tinting on them. It may be unusual at first but you will just get used to it. The amber tinting is present on the lenses so that it can slow down the highly vibrating waves of the blue light. This eyewear does a lot of filtration in front of your eyes. 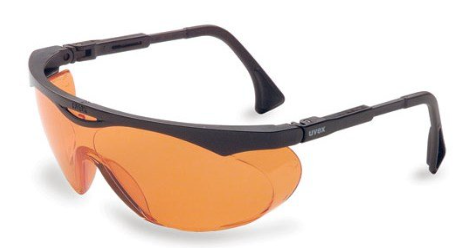 The company claims that these glasses can block almost all the harmful radiations that enter the eyes. Gameking computer glasses come with a lot of absolutely free stuff. Inside the package, you will get a hard-case for protecting your glasses. There is also a soft and exclusive Gameking cleaning fiber which is specially made for cleaning purposes only. Cyxus Blue Light Filter Glasses claims to protect the eyes from the harmful blue light radiations that are the major cause of various eye issues. The frame is made from highly condensed plastic which enables bending on the frames without breaking. Being a half-rimmed frame makes them extremely attractive and beautiful. You can wear them almost anywhere. There is also a transparent tinting on the lenses. The tinting and lens technology helps in decreasing the brightness of the light and adjusting it to a normal and more safer level. The glasses come packed in a hard case. You’ll also find a soft cleaning cloth within the parcel. These glasses surely proved all that they claimed. It does not only help in avoiding the harmful components of the blue light but also helps in maintaining a proper sleep cycle which often gets disturbed due to excess exposure of the eye to the blue light. Since the lenses have transparent tint, those people who need to see the true color of the screen can greatly benefit from this eyewear. Some of those people are graphic artists, architects and even gamers. Visionkr glasses have frames that has a style common for eyeglasses. This frame is rectangular-rimmed. The frame of Visionkr glasses are made of plastic. The whole package being made of plastic makes it to be lightweight, slightly flexible or elastic, resistant to corrosion, hypoallergenic and non-toxic. The available colors for the frames are black, black-brown, black-red, black-yellow, and demi. Other features of the lenses include anti-glare, anti-scratch, anti-reflective, anti-scree flicker, anti-fog, fingerprint-resistant, electromagnetic ray-resistant, and ultraviolet (UV)-resistant. Here are some helpful tips that you can use to maintain the effectiveness of this glasses. Always keep the glasses inside the protective case. This will ensure that it is safe even if it experience a sudden fall. Don’t use any other cloth other than the provided cloth in cleaning the lenses. Using other material can scratch the lenses. If you feel that the tinting on the lenses is unusual, just give it a time. You will just get used to it. 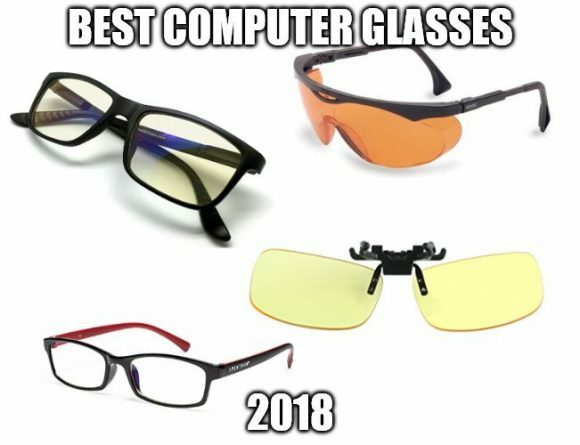 These are just some of the best computer glasses that passed my standards. Personally, I prefer the Spektrum glasses and J+S Vision. I like its simple appearance. Plus they offer a light tinting on the lenses that lessens color distortion on the screen. 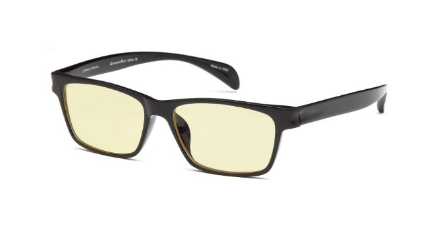 I also like the gameking clip on glasses. If you already have your own prescription glasses, this can benefit you the most. Nevertheless, all of this eyewear gives a premier protection for our eyes against the harmful radiations and blue light. So it is just a matter of choice on what you like and prefer. Be honest, all of these glasses seem good. Can you recommend one that you think best suits my situation ? Personally I like the gamma ray glasses and J+S vision glasses. Even if they don’t cost that much, they still serve their purpose when I use computer for long period of time. I have been using them for 2 years now and they seem to be durable. 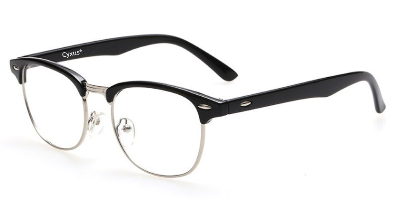 As someone who is on the computer quite often, you have done a great job at helping me decide what pair of glasses I should buy. I really enjoy the current ones I have, but they are getting old and I could use a new and updated pair. Your website is extremely informative and all your links work, way to go John! Sure man no problem. I am glad that I have helped you. Choosing the right computer glasses that suits your needs is important to prevent other issues on your eyes while using digital devices.